Have you ever watched a home improvement show and decided “I can do it myself.” The shows make it look so easy – and the whole house is renovated in just 30 minutes! It’s time for a reality check to see if you should really tackle a do-it-yourself (DIY) project. The National Association of the Remodeling Industry (NARI) created a simple yes-or-no quiz that you should take before you tackle a DIY project. 1. Do you enjoy physical work? Most home remodeling projects are labor intensive. You may discover muscles that you didn’t even know exist! 2. Are you persistent and patient? This reminds me of the a homeowner who decided to tackle removing the old flooring in his home. To his dismay, there were multiple levels of old flooring that had to be removed, he needed to rent special equipment to remove the flooring, and it delayed the completion of his renovation/addition by more than a month. 3. Do you have reliable work habits—meaning that once the project is started, will it get finished? How many times have you started a project and then life takes over? This happens to the best of us. 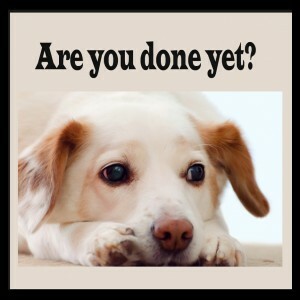 How much time do you truly have to devote to a project? 4. Do you have all the tools needed and, more importantly, the skills required to do the job? Not only do you need to have the tools and the skills, you also need to know the building codes. Additionally, if the project required a permit, and you do not get one, you can be fined, receive a stop work order, and worse yet – be told to remove all changes you made to your home. 5. What quality level do you need for this project? Are your skills at that level? Even painting is not just about getting a paint brush, a can of paint, and painting the walls. You need the right type of brush, the right type of paint, and the knowledge of how to prepare the painting surfaces. 6. Do you have the time that will be required to complete the project? Time… if only there was more of it. Just because the DIY shows make it look like a project takes no time at all doesn’t mean that is true! Always double or triple the time estimated for a DIY project, unless you are highly skilled and familiar with that particular project. 7. Will it matter if the project remains unfinished for a period of time? People with the best intentions sometimes don’t realize how long a project may take. 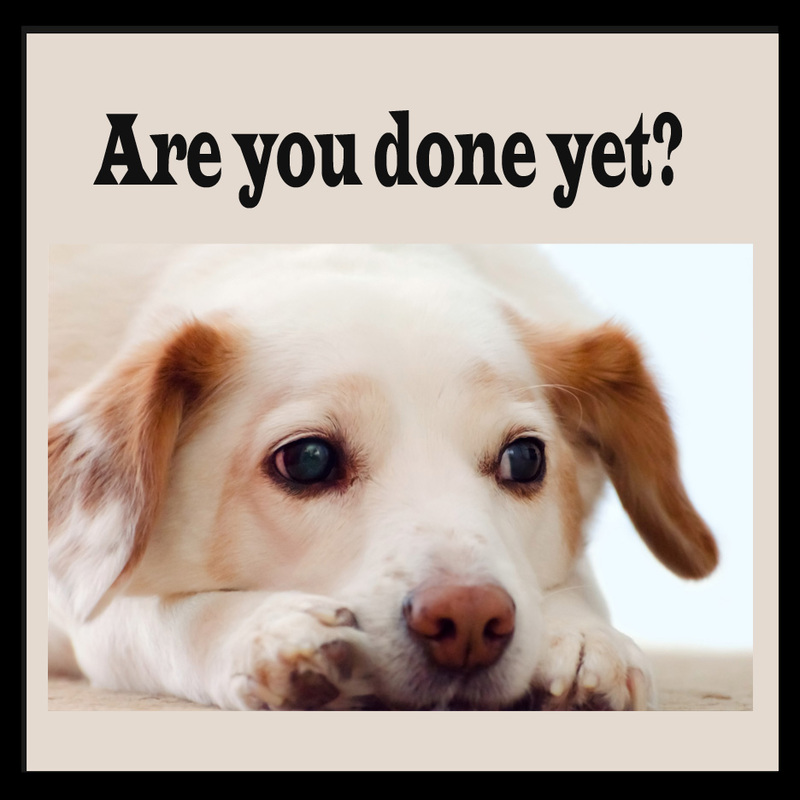 If you are only working weekends and nights to finish a project that may take 8 weeks, your project may take 20 weeks or more. How long do you want to live with your house in disarray? 8. Are you prepared to handle the kind of stress this project will create in your family relationships? 9. Do you know all of the steps involved in the project? Another true story – a homeowner hired Leading Edge Homes, Inc. to do an addition. As the project continued, the homeowner decided to add the new flooring to the rest of the house. Unbeknownst to us, the homeowner decided he wanted to save money and paint the rest of his home. He made that decision after the new flooring was installed. The homeowner should have taken this quiz before starting some DIY projects. He is only painting on the weekends – all of the furniture is sitting in the middle of the room. He didn’t think through the steps. He should have painted before having us install the new flooring! Now there are drips of paint on the new floor. 10. Is this a job you can do completely by yourself or will you need assistance? If you do need assistance, what skill level is involved for your assistant? If you need a professional subcontractor, do you have access to a skilled labor pool? 11. 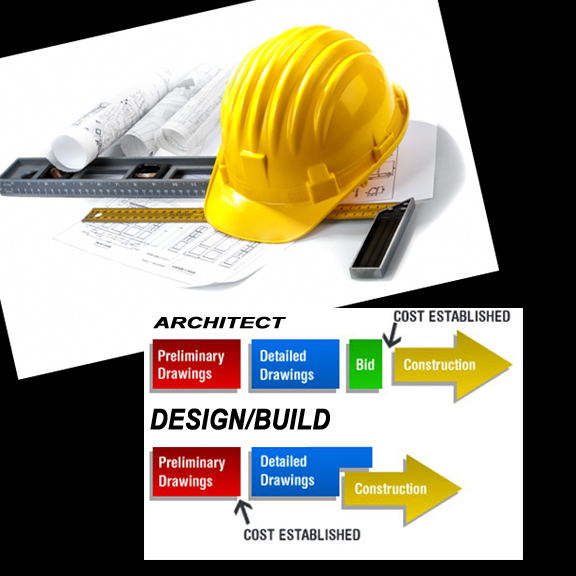 Are you familiar with your local building codes and permit requirements? (Some jurisdictions require that the work be completed by a licensed and bonded professional in order to meet code.) It’s best to check these requirements before beginning work on the project. Remember, if you fail to pull a permit you will end up paying more for your project than you imagine. Some municipalities charge you a penalty of triple the permit fee if you failed to pull a permit. Also, if you go to sell your home and work was done without a permit, you will have difficulty selling your home. 12. What will you do if the project goes awry? Many contractors are wary about taking on a botched DIY job and you may be forced to remove all of your handy work. All of the money and time you spent may be thrown away. 13. Is it safe for you to do this project? 14. Will you be able to obtain the materials you need? Who will be your source of supply? Will they deliver? The quality of some of the items you purchase at a big box store is often times lower than the same items you can purchase from building suppliers. 15. 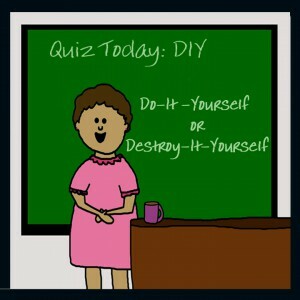 Are you attempting to do-it-yourself for financial reasons? If so, have you looked at all of your costs, including the cost of materials, your time, and the tools you need to purchase? If you are new to the DIY game, you may also want to look at the cost to correct any mistakes you may make—i.e., the damage factor. Will it still be a cost-saving venture? If you have to take vacation time to do the project, what is the value of what is lost? 16. If you are trying DIY for the satisfaction of a job well done—can you ensure that the job will be “well done”? If it doesn’t come out right, how will you feel? Will you be able to afford to redo any unsatisfactory work? Did you answer YES to some of the questions? Be honest — How many did you really say yes to? If you answered yes to 8 or more of these questions, NARI says you may attempt a DIY project. But, before you run for the nearest hardware store, revisit those questions you marked “No,” and carefully consider the potential problems you will face in those areas if you proceed with the project. Hiring a professional, like Leading Edge Homes, might be your best choice. A remodeling project can be one of the most important investments that you can make in your home. Work with an experienced roomologist (contractor experienced in room additions and home renovations) to plan and design your home improvement project. The planning phase is equally important to the completion phase. If you can imagine it, we can design it. For all of your home remodeling , contact your local certified “roomologist”, Leading Edge Homes. Inc. at 561-795-2551. Want to see some of our work? Visit our website or view our online book. A Leading Edge Homes, Inc. suite addition makes your home even sweeter. 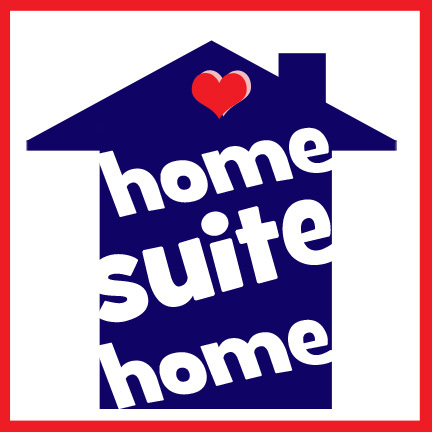 Adding a bedroom suite to your home can serve many different purposes. A “mother-in-law suite,” as it is often called, is a perfect living situation for your loved one that wants to keep their privacy and still remain independent. Or perhaps you love your home, but your family has grown and you need another bedroom – just don’t add a room, create an oasis for yourself! Generally, adding a suite will increase your property value. Future buyers see the added appeal of the addition that can be used as an office, a guest house/room, a temporary living area for a young married child or a returning college graduate, or as an alternative to an assisted living facility for an aging relative. Your addition can include almost anything – including the kitchen sink! But, most municipalities in Florida do not allow you to add an oven or stove, because that will take your home from a “single family” designation to a “multiple family” designation – a violation in most areas. Bedroom(s), bathroom(s), sitting area(s), a utility room, or a kitchenette are fine. Your kitchenette can have a sink (or wet bar), cabinets, and even a refrigerator. In Palm Beach County, there are many rules you don’t often think about that may apply to your addition if you have a septic system. The size of your septic tank and the size of its drain field may limit the size of your addition – if you are adding a bedroom or a lot more living space. But don’t worry, you can always increase the size of the drain field or add another septic tank in series if your existing one isn’t large enough to accommodate the addition. Do you want to build out or build up? Building up is generally more expensive because you will need have scaffolding, stairs, etc. Additionally, if the space is for an elderly relative, you need to think about how they will get upstairs in the event they no longer can climb stairs. How will you gain access to the addition? Is there a hallway you can use or an exterior door? It is best to have an experienced contractor, such as Leading Edge Homes, Inc., advise you on the best way to modify your current home to gain access into the addition. And yes, you can break through an existing exterior wall to make an opening into the addition – even a load bearing one. What is the maximum space that can be utilized for the addition? Municipalities vary on the front, side and rear set back requirements. This may limit the size and footprint that you can use to add onto your home. What is the purpose of the addition? Think about who will be using the area. I recommend planning for the future including designing with wider doors and hallways in case the occupants need to use a walker or wheel chair. Grab bars and no-curb showers are also something to consider – or at least have backing in the walls in the event you need to add grab bars in the future. Whether you are adding space for yourself or a family member, the design phase is the most important! Think about what you want, what special requirements you want, and how the area will be utilized. Work with an experienced roomologist (contractor experienced in room additions) to design and build your addition. If you can imagine it, we can design it. 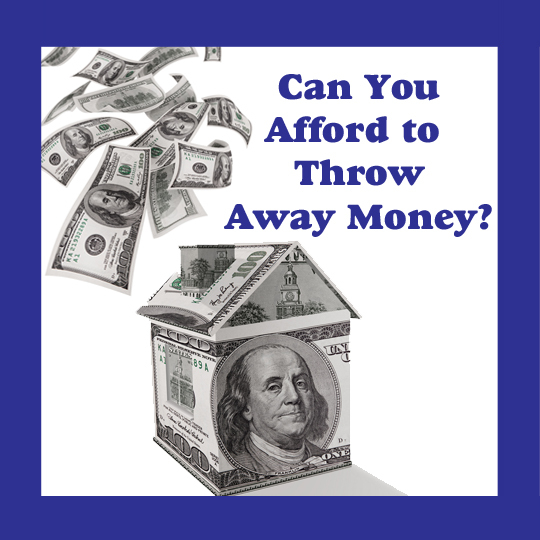 “Saving money” by not paying for a permit for your home improvement project is really like throwing money away. “A suburban West Palm Beach area couple will write a check for $12,000 to settle a code enforcement lien with Palm Beach County. But it could be worse: They were looking at paying about $1 million in the dispute, which has dragged on for 17 years. IS IT WORTH THE RISK OF GETTING CAUGHT? The Beasleys threw away $12,000 for a permit that probably cost less than $1,000 dollars 17 years ago. If you are caught having work done without a permit, you can face additional fines like the Beasleys, pay double for your remodeling project (if the code-enforcement department in your municipality requires you to tear down the completed work), and/or find it impossible to sell your home in the future. Work that was done without a permit may be discovered at the time of the sale of your home. A home inspector may check to see what permits have been issued for a property and verify that only those “permitted” changes have been made to a home. If a home inspector finds work done without a permit, he may advise the buyer not to purchase the home and report it to the local building department. There have been many cases where sales have fallen through – all in the name of saving money. DO I HAVE TO PULL A PERMIT? I am often asked, “Do you have to pull a permit?” My answer is YES if a permit is required for that particular type of job. YES … I believe that it is for your safety. YES … It may cost a little more money and time, but the potential problems for doing work without one is not worth any minimal cost savings. YES … I do pull permits. 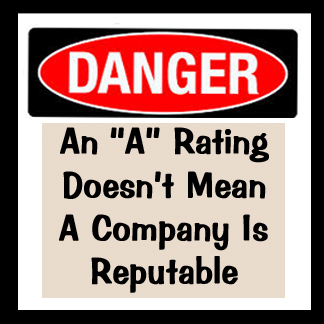 A contractor who says it not necessary may have something to hide, and that could be a red flag. Trying to cheat the system can cost you in the long run! 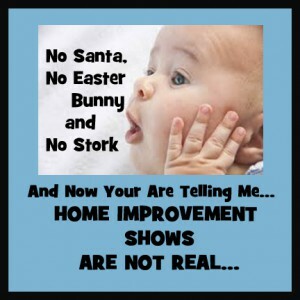 No, home remodeling is not like what you see on television – it takes time. To answer the question “how long will it take,” there is no clear cut answer. No two jobs are alike. Construction phases take varying amounts of time. The outline below is a general guideline of what to expect during a home remodeling experience. One thing to remember is that you may not see someone at your site daily when you do a home remodeling project. Scheduling, weather, inspections, and material availability all play a part in how long your project takes to complete. If you read through all of the following steps, you will see that there are many moving parts that must be coordinated to complete a project. Leading Edge Homes, Inc. tries to ensure that your home improvement project moves along as quickly as possible, but will never sacrifice quality for speed. Please note, not all of the following steps are required for each type of job. Each step is prefaced with an “A” for an Addition and “R” for a Remodeling / Renovation project. Rerouting of overhead electric, cable TV, and phone service, and sewer and water supply lines if necessary. Any existing structures (roof overhangs, screen rooms, existing concrete, etc.) in the way of the addition are removed. Land is cleared by machinery if site conditions allow, otherwise it is cleared by hand. For an interior remodel, the cabinets, walls, floor coverings, and fixtures in the work area are removed. This creates lots of dust. Make sure any objects that could not be removed are protected. Debris is placed in a designated area or in the provided trash receptacle. Leading Edge Homes, tries to clean up the site daily, however, at times piles of debris are visible. The addition area plus at least 3 feet beyond are cleared down to suitable soil. Fill dirt is delivered to the addition area and compacted. Please do not remove any of this dirt. It is needed to create the house pad. Footers are dug around the addition perimeter and forms are placed into the dirt. These forms are set in place with precision instruments, and a survey will be taken with them in place. Do not move or alter them in any way. Should you accidentally step on or disturb one of these forms, please contact the office immediately so the forms can be rechecked for accuracy before the concrete pour. A soil density test is conducted. A form board survey is performed. The underground plumbing, electric, and air conditioning pipes are placed in what becomes the slab. Do not remove or change the position of any of these items. They have been placed in the precise location in which they are needed. Separate inspections for each of these trades is performed. Inspections may not occur on the same day. All trades must pass inspection before work can proceed. This is the first of two sprayings to prevent termites. Do not touch the soil! It is hazardous to your health. Plastic, steel (it may be rusted, but that does not effect the strength of the slab), and recess forms are put into place. Once the pad is formed and passes all inspections, the slab will be poured. This is a difficult date to schedule. It is subject to weather conditions (on the date of the pour and on prior days), equipment availability, and the concrete finishing crew’s schedule. Your patience is appreciated. We are as anxious as you to complete this phase. If you can’t resist, please wait at least 24 hours after the concrete finishers have left before walking on the new concrete. Some concrete may squeeze out from under or around the forms. This is a normal condition. Loads of concrete may vary in color. This is a normal condition and does not affect performance. Sudden inclement weather conditions may require protecting wet concrete with a temporary plastic covering. This may result in an alteration of the finished appearance of the concrete surface. Do not be concerned. This does not affect the concrete’s performance. The exterior walls are framed with wood and / or steel. The roof trusses are set, sheathing is attached to the trusses and exterior walls, and the fascia is installed. It is time for another inspection. The exterior walls are built with masonry block. The column and beam steel is installed. The tie beam is formed, where and if needed. Wood scraps are fastened over any column clean out holes. Concrete is poured into the tie beam and columns. Note: This concrete is a special mix and appears to be watery! Do not be concerned. Its formulation causes it to be extremely strong when dry. The roof trusses are set, sheathing is attached to the trusses, and fascia is installed. The roof is dried in. Roofing underlayment is attached to the sheathing, and metal drip edge, valley, and “L” flashing is installed. Skylights (if any) are installed. If the final roof covering is tile, more roofing underlayment may be installed, and the tile is loaded on the roof. Otherwise, the final roofing material is installed on the roof. The window bucks and windows are installed. The exterior door bucks and doors are installed. Interior walls are framed and block walls are firred as necessary. You can now see your room(s). They may appear smaller than you expected, but will look larger once the drywall is installed. The rough air conditioning (duct work), plumbing (including tubs), and electric are installed. It is time for more inspections. Wire lath is installed over exterior sheathing, and in the soffits. Scaffolding may be present on your job site. DO NOT allow children to play on it. Hurricane tracks are installed (if they are embedded in the stucco). The exterior is painted, then roof tile, if applicable, is installed. Insulation is installed in the walls and ceilings. Drywall is fastened to walls and ceilings. In most municipalities, it is time for another inspection. The walls and ceilings are finished. This multi-step process is effected by humidity, and requires varying amounts of drying time. Wall and ceilings are spray textured, if applicable. Interior doors are hung, and pull down stairways are installed. Interior base and case moldings are installed. Tile is installed on floors and walls, if and where applicable. Shelving, mirrors, countertops, and tub skirts are installed. The air conditioning equipment and grills are installed. The final plumbing fixtures and faucets are installed. The electric switches, outlets and fixtures are installed. It is time for inspection of all the trades. The flatwork (sidewalks, patio areas, etc.) is formed. Soil in areas under roof are sprayed to prevent termites. Do not touch the soil! It is hazardous to your health. Reinforcing steel may, or may not, be placed in the flatwork area. The flat work is inspected. The concrete is poured. This is a difficult date to schedule, due to weather conditions (on the date of the pour and prior days), equipment availability, and the concrete finishing crew’s schedule. You may walk on the new concrete 24 hours after the pour. Do not drive on a new concrete driveway for at least one week. Loads of concrete may vary in color, and will NOT be the same color as existing sidewalk, driveway, or patio areas. There is no way to control the color variations of concrete. The final vertical spray for termites is performed. Any sod replacement and sprinkler repair specified is performed. Screens are installed in any windows. The dumpster and portable toilet will be removed from your site. The FINAL BUILDING INSPECTION is performed. The carpeting is installed. This is done after the final inspection because we want no one to walk on your new carpet but you! Leading Edge Homes thanks you for your patience and hopes you enjoy the changes to your home. If you are considering a home remodeling project or have been inspired by something you have seen on television and want to determine if it can be duplicated in your home, contact Leading Edge Homes, Inc. at 561-795-2551. We will give you a real, guaranteed price and our best guestimate of how long the project will take. Back in October, I posted a blog about the “ABC’s” of reality shows and home remodeling. Sadly, a couple from Raleigh, North Carolina did not read the blog! They turned to HGTV network’s “Love It Or List It” last year when they were considering renovating a rental property they had in Raleigh and moving into it with teenage foster children. “The couple contend that not only were they victims of shoddy work, they also suffered from a breach of contract, unfair trade practices in violation of North Carolina’s general contractor laws and a “bizarre” business model that creates an “inherent conflict of interest” for a production company that makes most of its money on TV advertising, ” according to an article in the Miami Herald. Reality home remodeling shows should be used for inspiration only. If you have been inspired by something you have seen on television and want to determine if it can be duplicated in your home, contact Leading Edge Homes, Inc. at 561-795-2551. We will give you a real, guaranteed price. Nothing is worse than having to tell a homeowner they have been scammed. This has been one of the toughest month’s for me as a home remodeling contractor. Two of the potential clients that I visited with were brought to tears and another one was strong enough to hold back the tears but realized they threw away money. The first of my heart breaking experiences happened in Palm Beach Gardens. A woman, had a leak, which unfortunately led to mold. But… the people she hired to “fix it” removed anything and everything that they could, down to the metal studs that were part of her exterior walls. There is no easy fix to put her home back together, especially because it is part of a quadruplex. The homeowners association won’t let her rip down what is remaining from the exterior walls and now they are in danger of collapsing, her insurance company is denying the claim, and the “friends” that helped her weren’t licensed. The only remedy she has is to hire a public adjuster to help her navigate the insurance company process and to hire a construction attorney to help her recoup her costs from the work that was done improperly. Until she gets the homeowners association to grant her permission to fix the exterior walls, she is in limbo. The next of my heart breaking experiences happened in Wellington where work was done without a permit and the second contractor is no where to be found. A homeowner needed work done on his home. The “contractor” who only could work weekends was caught doing work on the home without a permit. The Village of Wellington issued a stop work order, fined the homeowner, and had the electric meter pulled from the house as a safety precaution. The homeowner, after paying fines, hired another contractor. But, this contractor is now missing in action. 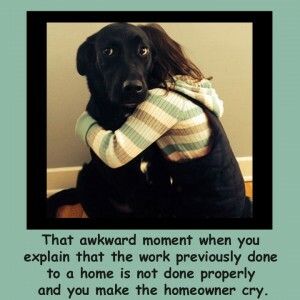 I advised the homeowner that I could not do any work on the home unless the permit was closed. Like the previous homeowner, this job will remain in limbo until the legal ramifications are solved. The last my heart breaking experiences this week also happened in Wellington. A homeowner wanted to remodel their kitchen and have an addition put on their home. They hired a draftsman to draw up the plans. The plans did not reflect what the homeowner wanted! The plans were what the designer wanted to draw. It is very frustrating to me that homeowners waste money on plans that won’t work. It is not that every designer/draftsman does a poor job… but I have seen it way too many times that plans are not usable because they are incomplete, don’t meet the homeowner requirements, or they are drawn incorrectly. Think about how your change will effect the look of your home. Realize that the newer things may alter how the rest of your home looks. That doesn’t mean you don’t make changes. But… think about how your changes can affect your vision of your home. If you are changing the floors, do you want to change the doors, their thresholds, the moldings? If you are adding additional cabinets, how are you going to tie the cabinets together? Will you need to resurface the old cabinets, change out all of the hardware, or replace everything? Making all the cabinet pulls the same may not be so easy. How the new handles get installed may not cover old holes. The old hardware may not easily be removed. When you do choose to remodel, look for someone with good listening skills who shares your vision for what your home should look like. Feel free to ask for references. Then, before you sign on the dotted line, check with your state to ensure your architect or custom builder is licensed in his or her field. 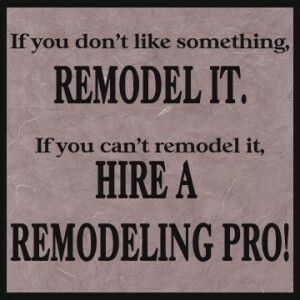 I have had many clients that have been afflicted by remodel-it-ism and have become remodel-it-aholics. a homeowner with an overwhelming desire to further remodel their home after recently completing a home improvement project when the new work makes other parts of their home look bad by comparison. As soon as you or your home remodeling professional complete a project you realize that the rest of the home needs a facelift too. For example, you build an addition to your home with new flooring, freshly painted walls, and a bathroom with brand new fixtures. Although from the outside the addition looks like it has always been there, from the inside the rest of your home looks old and tired. What are you going to do? Several weeks ago I told you that I was updating my appliances… including the cooktop, oven, and microwave. As a result, I am now a remodel-it-aholic. Although my refrigerator is in perfect working condition, it just does not fit in with the new appliances. I can look at it and say, but it holds food, keeps it cold, and functions just fine. But… there is something to be said for how it looks. I will keep you posted if/when we make that change. Don’t get tricked when starting a home improvement project or buying a new home. Yesterday I told you about the client who called Leading Edge Homes, Inc. to install a tub and we discovered that other work had been done in the bathroom without a permit. The good news is – the problems can be corrected. The bad news is – it will be costly. This reminds me of a home inspection I did last weekend. Yes, Leading Edge Homes, Inc. also does home inspections – and we do more than check to see if appliances work. The floor in a room is not at the same level as the main house. A sliding glass door leads to an interior room. There isn’t a minimum of 15 inches from the center of the toilet to the wall, tub, or cabinet. If it’s obvious that new cabinets were installed, but the electric was not brought up to date. How do you know? The receptacles need to be GFI protected, on a 20 amp circuit, and spaced no more than 4 feet on center. If there is a counter top with more than six inches of overhang, there must be an electric receptacle underneath it. If you want a professional remodeling experience or a home inspection with a home remodeling expert view, contact your local design-build contractor, Leading Edge Homes. Inc. 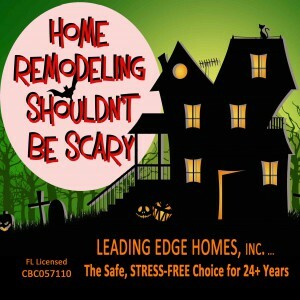 If you have questions about a home improvetment project, call Leading Edge Homes at 561-795-2551 or email Todd at: todd@leadingedgehomes.com and he’ll be happy to share his knowledge with you.